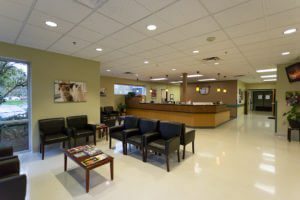 Our 24 hour pet hospital is located in Kirkland and also serves Bellevue, Bothell, Canyon Park, Kenmore, Lynnwood, Mill Creek, North Creek, Redmond and Woodinville. Emergency: In an emergency, call ahead to your BluePearl vet and let us know you’re coming. No appointment is necessary for our emergency vet.Learn more about your emergency visit. 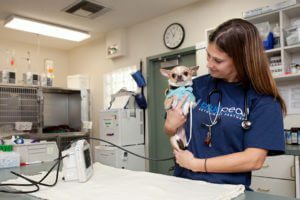 For a glimpse of how your pet might benefit from human-quality medicine, take a look at procedures offered in Kirkland by Seattle Veterinary Specialists – BluePearl. A cardiologist implants pacemakers, a surgeon uses stem cell therapy, and an internal medicine veterinarian offers tracheal stents. Those specialists, and many others, are also a resource for our 24 hour emergency vet practice at Kirkland, which has a dedicated intensive care unit. Our 20,000 square-foot hospital has a CT scanner, MRI, digital radiography, ultrasonography, fluoroscopy and endoscopy, along with a new on-site commercial pathology lab, opening in 2019. The hospital is located in a business complex near Jasper’s Dog Park. There is free on-site parking and easy access to Interstate 405.